REALbasic and REAL Studio Release 5.1 is now shipping. This release fixes some important issues with the new REALSQLDatabase plug-in. To view all of the improvements in this release, please view the release notes on the product download page: <http://www.realsoftware.com/download>. It's been a year since we introduced the new REAL Software Website and the feedback has been very positive! Following are some tips on how to take full advantage of all the great features. Enter the email address linked to your REAL Software Account to receive an email with instructions on how to create a log in. If you are unsure what email address is linked to your Account email Customer Service. Once logged into your Account you can access all your License Keys, your Order History and any Previous Downloads available for those keys. Did you Register but don't see all of your keys in your Account? It's possible you have created more than one account. Send an email with your keys and/or email address to Customer Service and we can merge all your accounts together. You may find you have expired keys you didn't even remember you owned! Just yesterday a long time user of REALbasic was planning on purchasing a new Windows Pro key, upon registering his Account he learned he owned an expired Windows Pro key already! He purchased a Renewal instead and saved $149! In your Account you can also update your contact information. Keeping your email address current will keep you informed of REAL Software special offers and discounts throughout the year. You can contact us at custserv@realsoftware.com if you have any questions about your Account, or anything else REALbasic, and we will be happy to assist you further. Due to some important issues with the new REALSQLDatabase plug-in, we are going to release 5.1 around the middle of the month. REAL Software began shipping REALbasic 2009 Release 5 today. This release continues with a focus on quality and addressing the needs of our customers by adding 68 improvements and 17 new features. 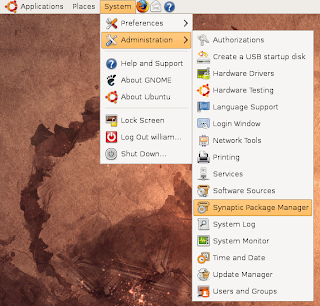 This release introduces support for Linux distribution Ubuntu 9.10 and includes an updated SQLite version. "We recently introduced a new feedback system that allows users to rate the importance of bugs and new feature requests," commented Geoff Perlman, REAL Software Founder and CEO. "This new system has allowed us to really focus on the quality improvements for this release that are most important to our customers." 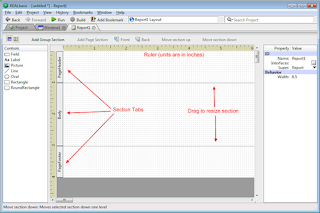 The complete list of improvements and new features in REALbasic 2009 Release 5 can be found in the release notes in the product download section, www.realsoftware.com/download. We had originally planned to update the REALSQLDatabase class to use the latest version of SQLite in REALbasic 2009 R4 (released today). The work was done but we also took the time to substantially overhaul the internals of the REALSQLDatabase class. We reduced the amount of code by quite a bit making it easier for us to maintain and made it faster as well. Unfortunately, the side effect of such a big change is that it requires more testing time and it was ready too late in the beta cycle for us to feel comfortable releasing it for R4. The good news is that we are planning to have another release this year primarily to ship the updated REALSQLDatabase class. Now that REALbasic 2009 R4 is shipping, many of you are wondering about the status of our transition to Cocoa for our Mac OS X framework. For those of you are are not aware of this, we are transitioning our underlying Mac OS X framework from Carbon to Cocoa. For the most part, this won't affect the code you write in that we are making these changes under the hood so you will continue to use the same classes you use today. We are nearly feature complete on our Cocoa framework. There are only a handful of controls left to do. Those on the beta list have been seeing our progress as we have released betas of previous releases (including R4). Once we are feature complete, we will start the final beta process, most likely within the next 30 days. At that point, we will take as long as is necessary to make sure the Cocoa framework is stable. And our plan is to ship the IDE based on Cocoa at the same time. The IDE is a large, complex project and is a good test case for the stability of the new Cocoa-based framework. If you are interested in beta testing the new Cocoa-based framework, make sure you join the beta list. You can do so by signing into your account on our web site and clicking on the Beta Program link on the right side of the page. Adding 97 improvements and 39 new features, REALbasic 2009 Release 4 offers the most requested feature from REALbasic users, reporting! Also included in this release for REAL Studio only is build automation. Finally, our new feedback system is now live. The new report editor allows developers to visually create a layout for printing by dragging and dropping labels, fields, images and more. Reports can be created to print a single page or multiple pages. The layout is divided into sections (header, body, footer as well as grouping sections for reports that have sorted data). The new build automation feature of the Project Editor is only available in the REAL Studio Edition. 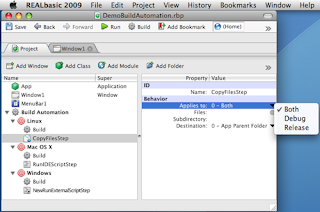 With Build Automation, developers can visually drag and drop build steps to execute common actions (like copying files and running IDE scripts) before and/or after their application is built. All of this can be done from within their project. Any company that expects to succeed had better listen to its customers. We listen in many different ways: We follow threads on the forums and mailing lists, we read the emails you send us directly, conduct surveys, and monitor the feedback you provide via our Feedback system. Over the years we have had many different systems for gathering bug reports and feature requests. We used to have a system that was pretty transparent. You could search it, contribute additional information to a particular issue, etc. We could get a sense of how important a case was based on the number of you that added that case to your watch list. This system was very specific to your needs, which are the needs of a software developer. As a result, this system was created in-house. A few years ago, an argument was put forth internally here at REAL Software that we shouldn’t be re-inventing the wheel by building and continuing to maintain our own, custom bug database system but instead should use one of the commercially available systems. There was a lot of sense in this argument. These systems had features that our system did not and they were maintained by others allowing us to focus on what we do best. But these systems were not without their downsides. The theory behind FogBugz, the system we use today, is to make the system of entering a bug as simple as possible for the end user because if you ask too much, users won’t provide feedback. The other assumption is that most users don’t need to search through your bug database. These assumptions are all quite reasonable for 95% of software users. It became obvious to us late last year that you, our customers, are not in that 95%. You are like us. You are software developers. You understand the importance of providing lots of detailed information. You want to search our bug database to see if a report has been filed before and see if a workaround exists. You will tell us which cases are more important than others. With this in mind, we decided early this year that we needed a new Feedback system. FogBugz is fine for most software companies whose customers are not software developers, but it’s not ideal for customers who are. However, if you are looking for a feedback system for your product, I would certainly recommend it. We spent some time looking at what was good and bad about our old system and what was good and bad about FogBugz. We then set out to build a new Feedback system that would give you and us the best of both systems. While the old system was designed to be opaque, the new system is almost totally transparent. You can search, and the searching is actually very cool. It’s simple and yet very powerful. It also includes relevancy information to help you track down the case that is the most likely match. You can filter reports by product, version, status and more. You can keep a list of your favorite cases to make it easy to keep track of them. You can contribute to existing reports, adding workarounds, example projects, etc. that others can use. If there is information that should be for our eyes only, you can mark the information you add as private. And last but most certainly not least, you can put your most important cases in order of your personal priority. This and the priorities of others are put together to create a score. This allows us to see what the most important cases (both bugs and feature requests) are. You will be able to see them too because the new Feedback system will show you the top 20 cases by score. We have added this because we want you to see that we are making an effort to address the most important cases first. That’s not always possible of course and some bugs get addressed as soon as they come in because they are very easy to fix and an engineer might be working on that part of the code when the bug is reported. In the past, the score of a case was essentially the number of people that added that case to their watch list. Anyone could add any number of cases to their watch list to increase the priority. The problem with this is that it didn’t give us a true picture of what your priorities are. In the new Feedback system the only cases that are scored are those that are within the top 5 open cases on your personal priority list. The new Feedback system makes it easy for you to reorder your cases so that we can see your personal priority. Also, in the case of REALbasic, the edition of REALbasic you are using affects the score your top 5 open cases receive. Professional Edition users are given 3 times the priority of Personal Edition users. REAL Studio Edition users are given 10 times the priority. We are doing this because the more you invest in us, the higher we feel your priority should be. That doesn’t mean that a Studio user would always get higher priority. For example, if fifteen Personal Edition users put a particular case at the top of their list, that would have a higher score than a case at the top of a single REAL Studio Edition user’s priority list. This scoring system will help us understand which cases should be addressed to have the maximum impact on you, our customers. When we have changed systems in the past, we have asked you to go through your cases and help us move them over to the new system. For some of you, this was a lot of work. We will not be asking that of you this time. We have automated the process of moving the cases over. However, we will need you to do one thing. Because you can’t search our current Feedback system, it is implied that all cases are private in that others outside of REAL Software can’t view them. We would not want to accidentally expose to everyone a case you thought was private. As a result, you will need to tell us (via a web page) which of your reports should be private and which should be public. 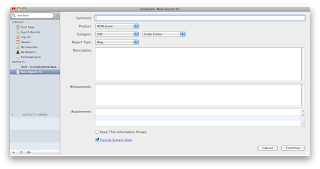 This new Feedback system runs on Mac OS X, Windows and Linux and will ship soon with REALbasic 2009 R4. It’s going to help us better serve you and it’s going to better allow you to help each other - whether it’s providing a workaround for a bug, or discussing the pros and cons of a particular feature. We look forward to your comments and suggestions. We are very excited to announce today that we are taking REAL World on the road this Fall! We'll be heading to Atlanta on November 3 and Chicago on November 5th for full day conferences in each city. The Atlanta event will take place at the Marriott Marquis Hotel and the Chicago event will be at the Hilton downtown. The REAL World Regional Events are the definitive events for anyone who wants to get the most out of REALbasic, REAL Studio and REAL Server. This conference will give users the opportunity to hear from other REALbasic, REAL Studio and REAL Server users and experts on how to improve their knowledge and skills as a developer. These events will feature a keynote presentation from Geoff Perlman, REAL Software's Founder and CEO that will cover upcoming features, like Reporting and Cocoa, along with REAL Software's strategic direction. We are currently looking for speakers to present at each event. We do offer speakers a free pass to the event. Those interested in presenting REALbasic, REAL Server and software development-related sessions are welcome to submit their proposal with their preferred session topic(s) and a brief description, along with their name and contact information to me at realworld@realsoftware.com. The deadline for applying to speak is September 15, 2009. There are a limited number of speaking opportunities available. Registration for these regional events will open soon. Conference pricing has been set at $250, with an early registration price of $200 through October 20th. Attendance is limited to 50 attendees, so please register early to guarantee your spot. More details about the sessions, along with a more complete agenda, will be available in the coming weeks. I've seen many examples over the years regarding gradients. Start with one color, then progressively blend it into another. What I haven't seen yet is how to create complex gradients with 3 or more colors. If you can create a two color gradient, a multi-color gradient is conceptually similar. AUSTIN, Texas, USA (July 7, 2009) — REAL Software, creator of REALbasic, a cross-platform development tool for creating software for Mac, Windows and Linux, is now shipping REALbasic and REAL Studio 2009 Release 3. This release boasts more than 100 improvements and 31 new features, including the addition of OpenGL support for 3D images and animation. "REALbasic is powerful enough to allow me to develop 2D applications requiring a complex interface faster than any other compiler," commented Stephan Keith, a REALbasic Developer. "With the introduction of OpenGL to REALbasic, and its extraordinary interface development tools, I should be able to develop 3D applications 50% to 70% faster over those using traditional C-programming methods." The new OpenGLSurface control does require a knowledge of the OpenGL language. However, there are some open source projects that are implementing a RB3D-compatible API on top of the OpenGL for developers who currently use RB3D. REALbasic was recently named 'Best Programming Language' during The Code Project's First Annual Members Choice Awards. The complete list of improvements and new features in this release can be found in the release notes in the product download section, http://www.realsoftware.com/download. REALbasic and REAL Studio are available in a free 30-day trial edition. REAL Software recently published an Introduction to REALbasic video on YouTube.com. We recently changed the price of REALbasic Personal Edition for Linux to $99, which is the same as the Personal Edition for Mac and Windows. However, if you are developing an open source project, Personal Edition for Linux is still free for you. To obtain your free Linux key contact Customer Service and provide them with documentation about your project, such as your name on an open source website. We are making this change because most commercial software that has a free version for Linux is typically free only for open source projects. In code it's very important to say exactly what you mean and mean what you say. I just happened to reproduce and fix a bug in the IDE that was the result of code not being explicit about what was intended. But this was throwing an out-of- bounds exception sometimes when you'd press return. But, why? gets evaluated BEFORE the OR. The end result was IF you pressed return the code for the THEN portion WOULD execute when it should not and this caused the out of bounds exception. So the listindex had to be <> -1 before the code in the then would execute. A very small change, but a very big difference. Most desktop computers have used 32 bit processors for a long time now. Among other things, a 32 bit processor limits the amount of memory a computer can access to 4 GB (or to be more precise, 4096 megabytes). The world is moving towards 64 bit processors which can, in theory, address 16 exabytes (16 billion GB!) of memory. Most 64 bit computers don't support that much memory of course but 64 bit computers will certainly allow for a lot more memory than we have today. For most REALbasic users this change won't require much, if any, work. When we ship a 64 bit native version of REALbasic, integers will be 64 bits rather than 32 bits. That doesn't mean much to most of you. For those of you that are doing bit manipulation and using certain classes, it will most likely mean your code will need to be updated. Today you have the ability to specify that you want an integer that is 32 bits or 64 bits. Rather than using Integer, you can use Int32 to specify a 32 bit integer. If you are reading and/or writing integers using the MemoryBlock or BinaryStream classes, use the methods provided in those classes to read/write 32 bit integers if you are using the regular Integer methods today. If you are doing integer bitwise operations or are using integers with binarystreams or memoryblocks, you can update your code today so it will continue to function properly once we provide the ability to compile your project as a 64 bit native application. 64 bit is something we will be addressing to allow your applications to be 64 bit native. I don't have a timeframe to announce just yet. However, those of you that are depending on 32 bit integers (and if you are, you know you are) can update your code now so you won't have any hiccups when compiling 64 bit native applications arrives. What is your "day job"? Are you a school teacher, engineer, librarian, graphic designer, piano teacher, chef, or something else during the day and also a REALbasic developer at night? Submit your photograph to the REALbasic yearbook and be displayed on our website! Send me your picture at pr@realsoftware.com. View the REALbasic Yearbook Photo Guidelines. Do you have some cool code you want to share? Post it on The Code Project and share it with the world! Sharing code with others is both an excellent way to help other developers, but it also helps you become a better programmer. The Code Project has more than six million members, so by sharing your code you will get a lot of great feedback, bug fixes, free testing and suggestions. Submit your article to The Code Project. Learn more about The Code Project. Something that every developer seems to hope they don't have to deal with. But I'd say you should want to deal with localization, because if you're localizing your application into many languages then it's also very likely that your application is widely used and hopefully really successful. REALbasic makes doing most localizing very easy. 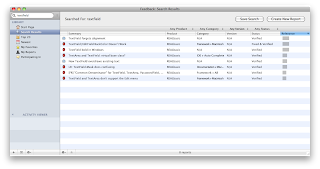 Just use dynamic string constants and that will take care of the bulk of your needs. If you plan ahead and use dynamic constants for captions on buttons, strings shown in message dialogs and all the other strings you show in your application you can be ready to localize into any of the languages that REALbasic supports. But what do you do if after you've created your application you need to localize it into a new language ? And you don't need to do anything else but localize it? You don't need to recompile the application to do this. Specify what language localization you are creating as the target language. Import this .rbl file into Lingua and make whatever changes you need using Lingua to add in the new values for this localization. Then, when all your changes are done, choose "Export to Application" under File > Export. This will add a new localized file to your application that is set up for the new language. This works for OS X, Windows and Linux. Note that your application MUST be set up with dynamic constants BEFORE you do this. You cannot change an already compiled application that does not use dynamic constants into one that does by this process. On OS X there's an alternate way that does not require Lingua and can actually be done by anyone at any time. You can open the application package and navigate to the Resources directory inside the package. Inside will be any number of directories named with a .lproj extension. There you will see a file called Localizable.strings which holds all the strings that can be localized. Once you've created this you have a new localization without recompiling your application. There is a saying that you can have something "good, fast or cheap" but you have to pick one. If it's good, you won't get it fast or cheap. If it's cheap, it probably won't be good or fast. You get the idea. That saying is not new and it's not even always correct as it's highly subjective. But it is true more often than not. As most of you probably know by now, we are working on a new Mac OS X framework for REALbasic. The framework is code that lies beneath your code and translates what you've written in REALbasic into operating system-specific API (Application Programming Interface) calls. For example, in REALbasic you put w = new window1. Behind the scenes we call CreateWindowEX on Windows, gtk_window_new on Linux, and NewWindowReference on Mac OS X. Our current Mac OS X framework uses the Carbon APIs. These APIs were created to be compatible with Mac OS 9 (Classic Mac OS) as a means to port these apps to Mac OS X. The other set of APIs for Mac OS X is called Cocoa. These were part of NeXTStep which eventually became Mac OS X. It's become increasingly clear over the years that Apple is focusing its attention on Cocoa. It's understandable that they would want to do this rather than have to update two APIs for each new feature. Several years ago we started a project to create a new Cocoa-based framework for REALbasic. This wouldn't change how you work with REALbasic or how you support Mac OS X (well, not much anyway) but it would provide users with a better experience and allow us to expose new Mac OS X features faster. The project failed. But we are nothing if not tenacious so 15 months ago we started a new Cocoa project with a new approach. Based on our experience developing frameworks for Mac, Windows and Linux, we believed that we would be in beta by Q1 2009 and shipping by the end of Q2 2009. It hasn't worked out that way. We are making terrific progress. It was slow going at first but we able to move faster now that we have laid the groundwork. At this point, we should be feature complete by the end of the summer and shipping some time this fall. So our schedule has slipped by one quarter. I know many of you were hoping to have Cocoa sooner and I'm sorry to disappoint you. But we would rather do it right than have to do it over again. So when it comes to good, fast or cheap, we are choosing good.